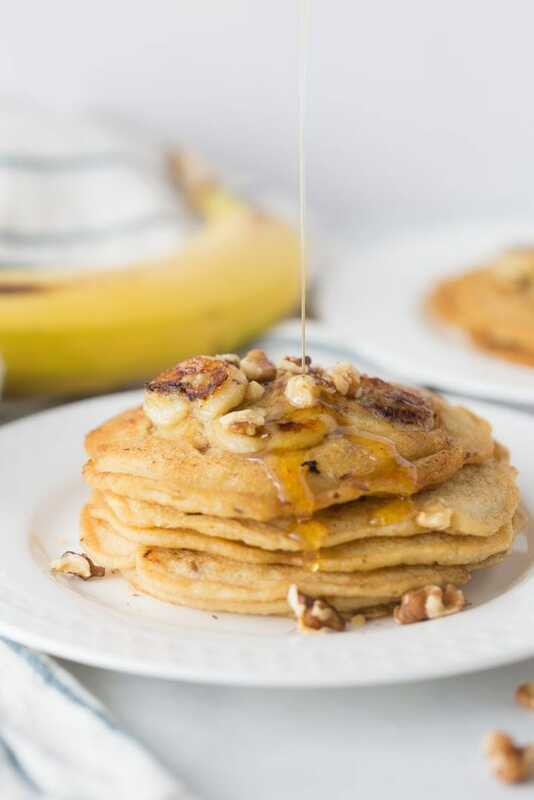 These 21 Day Fix Pancakes with Caramelized Bananas and Walnuts are a decadent breakfast treat – you will have no idea that they are low in sugar and dairy/gluten free! Have them for breakfast or dessert – your choice! 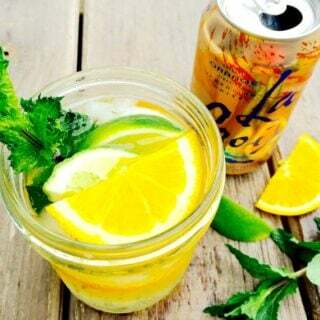 With Father’s Day coming up this weekend, I wanted to create a recipe in honor of my husband who truly is one amazing dad. And without him, this blog would not exist. 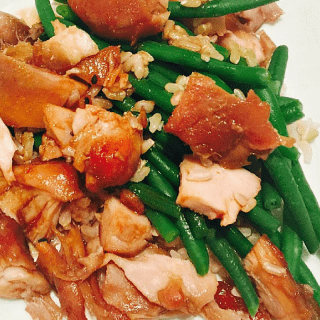 I mean, not only is he cleaning up the kitchen as we speak so I could write up this post, he is the official taste tester of the blog…and while I make a LOT of meals for us, it’s only the recipes that he gets really excited about that actually get posted. And it doesn’t hurt that he is pretty easy on the eyes. 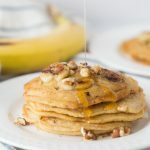 I was originally thinking of some sort of grilled meat for this post, as those recipes do really well this time of year and we both love to grill, but I have also wanted to try a healthy version of these banana pancakes my husband fell in love with on a trip to Puerto Rico for forever. I had a brand new bag of my favorite Bob’s Red Mill Gluten-free 1-1 Baking Flour and some extra time to kill last weekend, so I finally gave it a go. 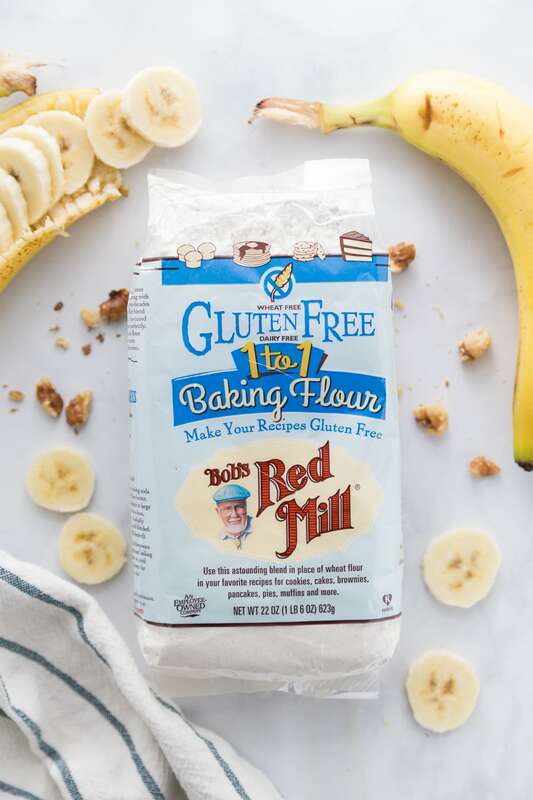 This is the same amazing gluten-free flour that I used for my Banana Bread ,which is a total Confessions reader favorite, so I had high hopes it would also make a delicious Banana Pancake. I was a little nervous, though, because my husband has been dreaming about them (aka hyping them up) for over ten years…I mean, they were absolutely decadent and I’m sure full of butter and sugar and all things delicious. Oh – and of course they were drenched in syrup. Have I told you about my husband’s crazy sweet tooth? He literally loves sugar. Where I can never get enough chocolate, he goes for things like Skittles and Starburst…the kind of candy I buy at Halloween because I know I won’t eat it (but gimme all the Reeces). And so I had to figure out how to make these pancakes gluten free, dairy free, refined sugar free, and 21 Day Fix Approved, while also satisfying his decade long desire for these pancakes and his off the charts sweet tooth. 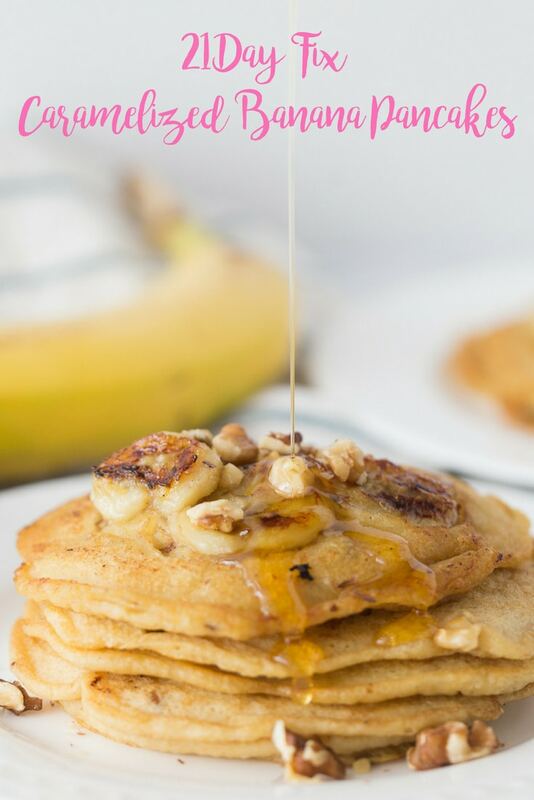 Bananas do add lots of sweetness to baked goods, but I already tried to mash banana into the pancake batter once before, which he scoffed at very quickly, so I knew I had to try a different approach. And because caramelizing adds even more sweetness to bananas, I had the idea to slice them, cook them a little in some butter, and then top it with some of my gluten free pancake batter. I also tossed a couple chopped walnuts in there, too, so they could get nice and toasty and give the pancakes a little crunch. Omg. Guys. It. Freaking. WORKED. 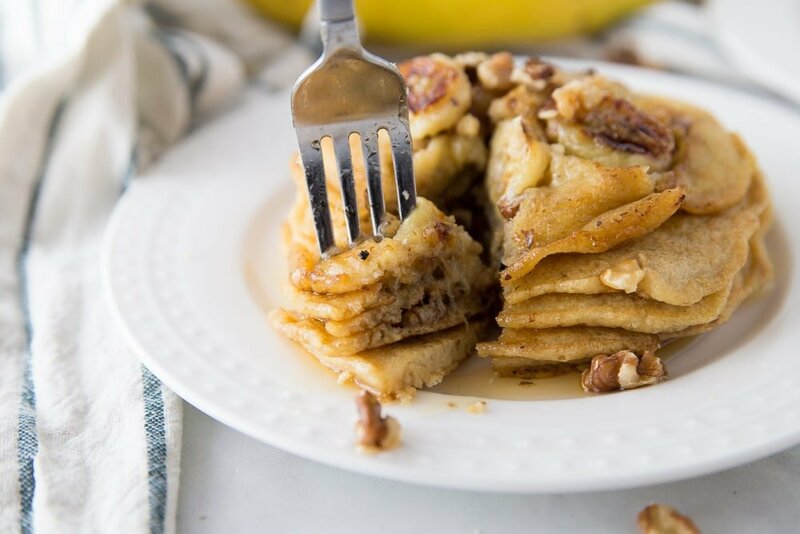 There’s hardly any added sugar in this entire recipe, and yet, with the tiniest little drizzle of syrup, these pancakes are like heaven on a breakfast plate. So sweet and buttery delicious, my husband totally LOVED them. They might not be the prettiest pancakes in the world, but you will hardly care when you taste how crazy good they are. We added a few extra slices of caramelized bananas and some additional toasty walnuts on top and seriously, they could be dessert! Oh – like Bananas Foster Pancakes, even! These would be delicious for a Father’s Day Breakfast to celebrate your own amazing husband or dad, or to meal prep for yourself for the week, because honey, you deserve it! 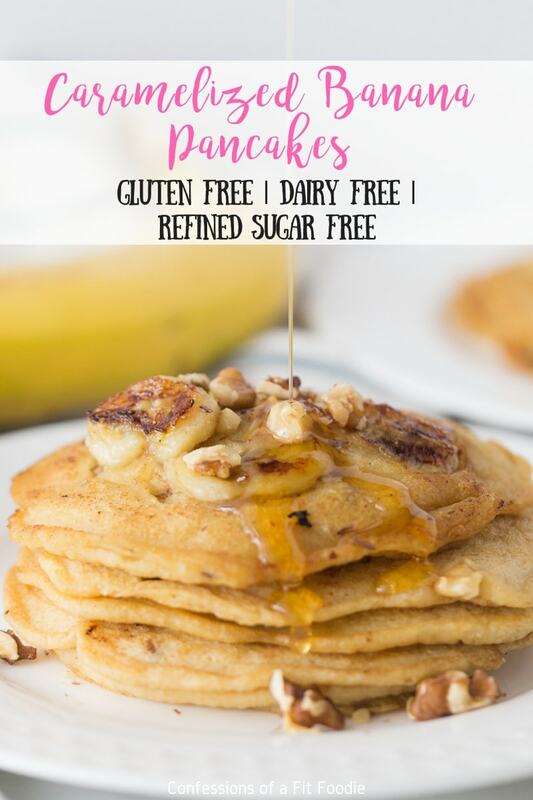 And, just an FYI, this pancake recipe makes a great base even without the bananas, so you can customize it to fit your favorite flavors. 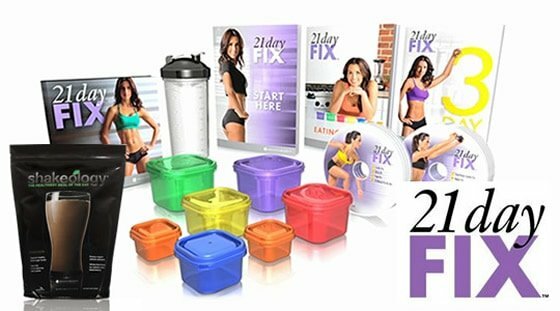 If you try them out, let me know what you think or tag me on social! 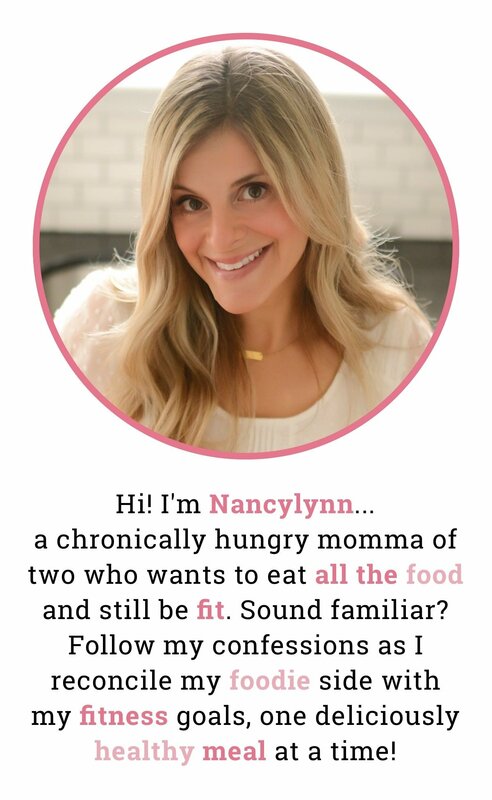 I love to see your healthy creations! Thank you Bob’s Red Mill for sponsoring this post. It means so much to me to work with brands that I love and use in my kitchen every day! 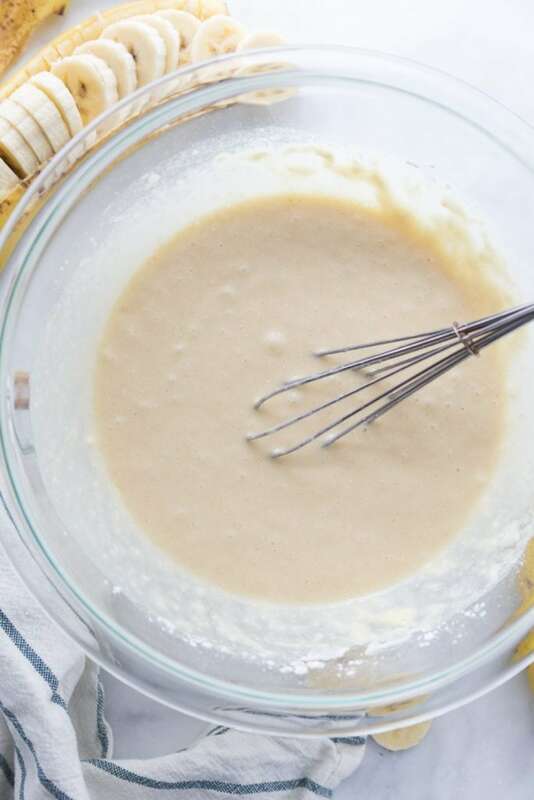 Whisk together milk, eggs, melted butter, vanilla extract, and maple syrup. In a separate bowl, mix flour, baking soda, baking powder, and salt. Add dry ingredients to the wet ingredients and stir until combined. Batter will be lumpy! Don’t overmix – those lumps are the key to fluffy pancakes! Let batter rest for a few minutes. 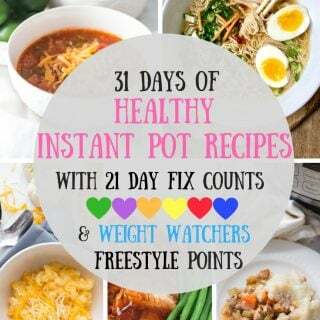 Heat a nonstick frying pan or skillet to medium low heat and spray with cooking spray. Melt 1/4 tsp of butter and place 4 banana slices on the pan, so they are touching and make a square. 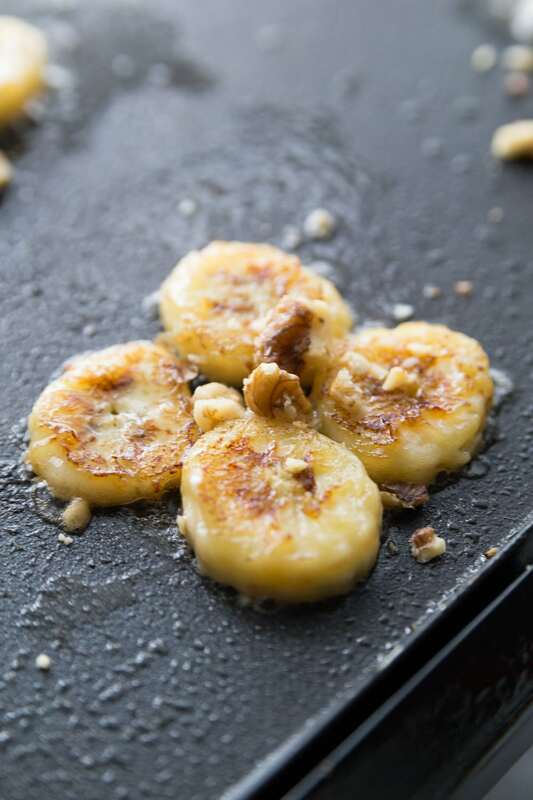 Let bananas caramelize for a minute (I like to flip mine) then add a few crushed walnuts to the pan. 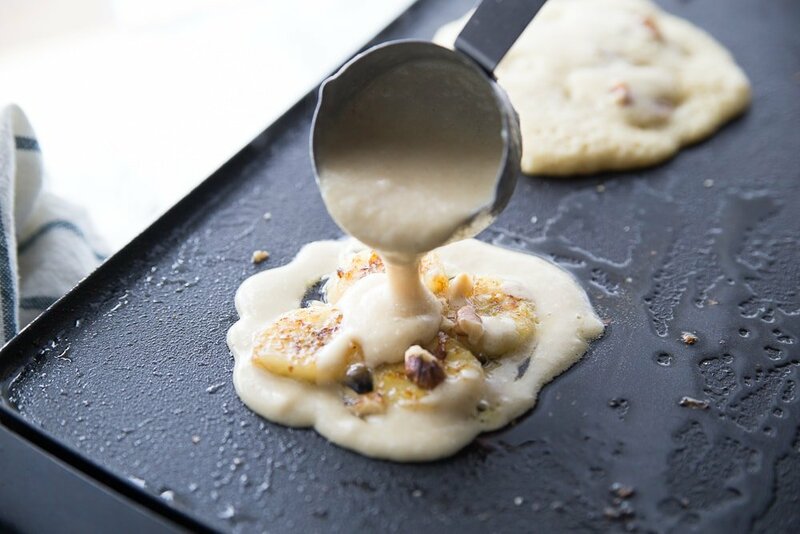 Pour a large spoonful of the pancake batter over the bananas and nuts (I use a ¼ measuring cup slightly less than full). Cook until the edges begin to crisp up and the pancake bubbles are open. Carefully flip and cook the second side until cooked through. Repeat with remaining batter. You should get approximately 12 pancakes. 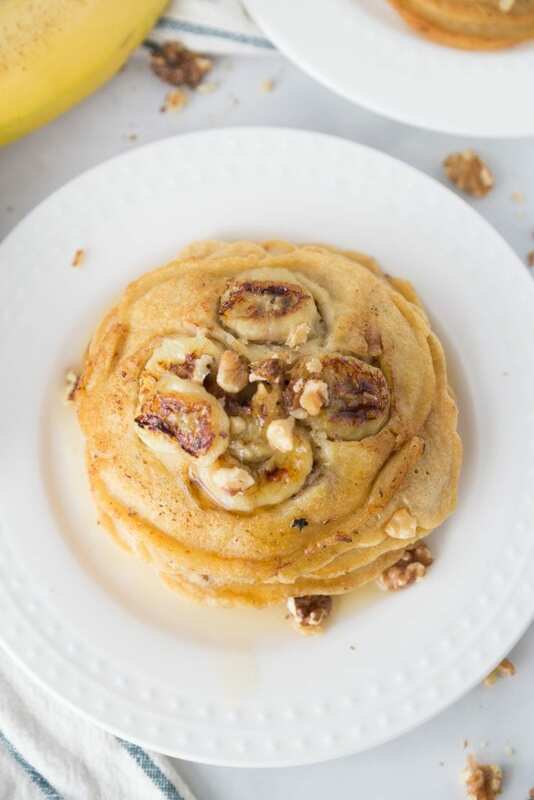 Top with additional walnuts and banana slices if you have extra and a tsp of maple syrup. I just stocked up on Bob’s Red Mill products yesterday, and was dying to play with them–making this!! I have to admit! 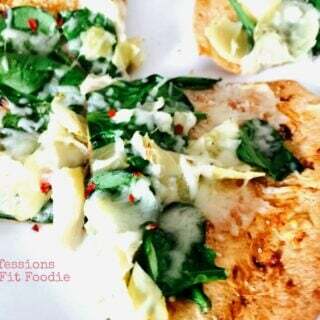 I wasn’t so sure switching flour- I LOVE IT! My kids love these pancakes. I think we have made them 5 times this summer! Thanks for sharing!! Oh my goodness, YAY!!! This made my entire day!!! My dad, who is 96, always made the BEST Bisquick pancakes. So good that I rarely have ever ate pancakes out. But eating clean means I have tried a ton of new stuff. So I did. I made them. Dad, hubby and I had the best lunch! Sweet and filling. Dad even complimented how good they were! Yay! I did have difficulty in execution. I imagine because I used whole wheat flour.. The pancakes would break when I tried to flip them. So I used the spatula to break them up smaller when carmelizing and that work! Thank you for another successful meal! I just love this so much, Brenda! Thank you!